The Dungeon Bulletin Board: Technique Tuesdays: Gussets and Gloves! Technique Tuesdays: Gussets and Gloves! Gloves, mittens and fingerless mitts are all the rage in charms these days! Fingerless mitts can be some of the fastest and easiest projects out there. They can be made from fine sock yarn, plump bulky wool or many yarns in between! 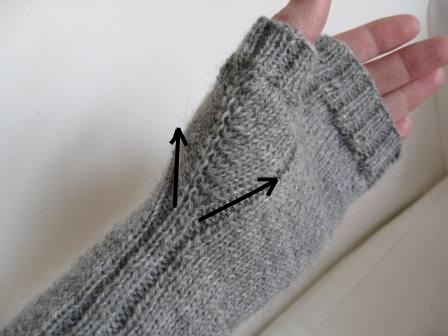 Ranging from the simple to the sublime, let’s take a look at construction methods for fingerless mitts. The simplest fingerless mitts are rectangles knitted the length of the mitt, and knitted as wide as the wearer’s hand. This flat rectangle is seamed along the side from the bottom up to where the thumb goes, skipping about an inch for the thumb and then seamed to the top. This style of fingerless mitts works best is ribbing or garter stitch as both are stretchy and will help provide shape to the mitts. Fingerless mitts lend themselves well to being knitted in the round, since a tube can be fitted better to the hands than a flat rectangle. However hands are not a perfect cylinder. Our pesky opposable thumbs keep getting in the way of a nice, neat tubular glove. Since we need those thumbs for knitting, we’ll have to craft our gloves to accommodate them. This is where gussets come in. A gusset is a shaping device in garment making, created by adding a wedge of fabric that provides extra space for movement or shape. Unlike sewing where an additional chunk of fabric must be sewn in, knitting gives crafters the option to add extra stitches as we go. That means fingerless mitts can be shaped without seaming – how cool is that? If you look at a pair of fingerless gloves with the thumb facing towards you, you will see a “V” shape where the thumb goes. The bottom of the V starts at the bottom of the palm / top of the wrist, and it increases to the bottom of the thumb. The V is your gusset. The way to create a gusset is to pick a stitch where your thumb will go, and make increases on either side of it. However human palms are not puffy round balls, but gentle curves. This means you do not want to increase every round. If you do, you will end up with a gusset that is too wide and too short. When wearing a gusset that is too wide and too short the thumb area will be baggy (and, incidentally, cold! Chilly air gets in the spaces!). So what you will want to do is increase every 2nd or 3rd round. How often you increase will depend on your yarn weight and your pattern, so read the pattern carefully! Many patterns will simply say ‘increase.’ If you’re trepidatious about this whole gusset thing, choose a straightforward pattern and a yarn you love and make whatever increases you are comfortable with. You will get the correct shaping and fit for your gloves with this method. But if you want a neat, structural V shape we have to go one step higher in complexity and not just work increases, but paired increases. The increases that work best for gussets are ones that can be worked without a ‘hole’ and ones that ‘lean.’ Since you are creating a V shape, you will want one set of increases to slant towards the right, and the other set to lean towards the left. We have two likely suspects for paired, leaning increases: make 1 left (M1L) / make 1 right (M1R); and the left lifted increase (LLI) / right lifted increase (RLI). Many patterns will indicate a particular increase to use depending on the designer’s preference; however once you understand how gussets are formed with paired increases these two are frequently interchangeable. Fortunately these increases do exactly what it sounds like they do. Make 1 left and the left lifted increase both lean towards the left; make 1 right and the right lifted increases both lean to the right. So when you are knitting in the round you will want to start the gusset with a right leaning increase, knit across the gusset stitches and end with a left leaning increase. So, let’s take a look at how to make them. Make 1 left and make 1 right are slightly more common. They are formed by scooping up the yarn in between two stitches and knitting it so it twists into a nice, tight stitch. If you knit it without twisting the stitch it will look more like a yarn over and leave a little hole. The left lifted and right lifted increases involve lifting a previously worked stitch back onto the needles and working it again. The biggest difficulty in this one is knowing which stitch to lift! When your gusset is done, you will take the stitches you worked in the gusset off the needles and hold them on stitch holders or waste yarn. The rest of the stitches are rejoined into the same happy tube you started with, but now there is space for your thumb to go! When you are all done you will pick the thumb stitches back up on to the needles and knit them into a teeny tiny tube for the thumb. Now that we know how to make gussets, let’s look at some free patterns! And for you overachievers... The following mitts have partial fingers, which we all know is a gateway drug to full out gloves! Go forth and knit for fun, for warmth and for the glory of Slytherin! !